Many people are recipients of false knowledge. Sometimes, what we have always believed to be the right thing is actually wrong, including matters concerning health and fitness. Here are some health and fitness myths about health and fitness that you might have thought to be true, but are actually not. 1. You will catch a cold when you go out with wet hair. Feeling cold does not really weaken your immune system. You may feel cold, but you will not necessarily catch cold. In a study conducted by Common Cold Research Unit, it is proven that feeling cold is not really the primary factor of catching colds by asking a group of men to cooperate in an experiment. Half of them stayed in a warm room, while the other half took a bath and stood dripping wet in a hallway for half an hour. Neither half of the group caught colds. 2. Reading in dim light harms the eyes and results to poor eyesight. Reading in dim light will not harm your eyes, neither will it result to poor eyesight. However, it will tire them. It is because too little light make it too difficult for your eyes to read, making the cornea and lens on your eyes focus too much on the image. Resting your eyes and keeping the light at a comfortable level, in this case, are important. 3. Wetting your tired hands will make them sweaty and shaky. It is tiredness itself that makes the hands sweaty and shaky, not the wetting. Another reason is lack of vitamins, particularly in vitamin B1, B6, and B12. So when you get your hands tired from the dirty work, do not hesitate to wash your hands. It will do you no harm. 4. You can burn more fat during workout on an empty stomach. Empty stomach does not necessarily contribute in burning calories. In fact, working out on an empty stomach burns more muscle, not fat, which contradicts the purpose of any fat-loss diet and workout. Also, you wouldn’t be able to maximize your workout performance since fasting deprives you of nutrients needed for extra energy. 5. Women need different exercises from men. Hormonal make-ups make men possess stronger muscles than women, but that does not necessarily mean they should work out differently. When it comes to fitness, women and men are the same. Some believe that men should focus on working out their upper body while from core and hips down for women. However, it is wrong. It’s the same as leaving the other half of the body unfit. 6. Eat only egg whites. Egg yolks are bad for your cholesterol balance. Egg yolks don’t affect your cholesterol balance. According to a study by the University of Connecticut, the fat found in egg yolks actually help reduce LDL or bad cholesterol. Also, most of the vitamins and minerals in eggs are found in egg yolks. It can even give you half the protein the egg whites have, which is good for your muscle workout. 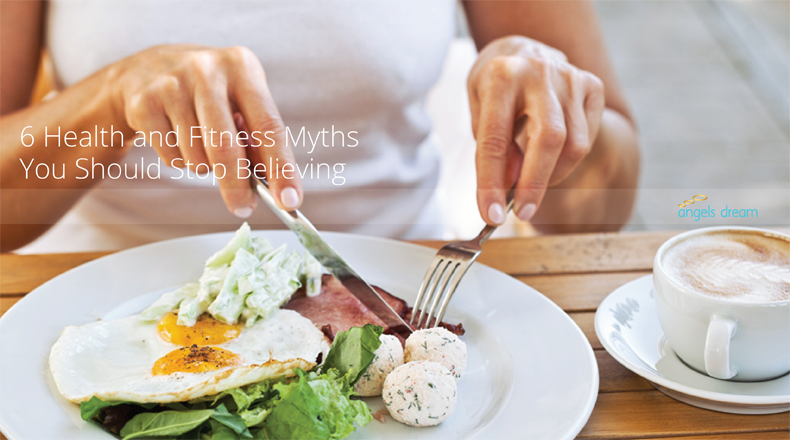 Know myths from facts in order to get more out of our health choices.